The Gotcha Sprayer is excellent for use around schools to reduce the risk of children being stung by wasps and hornets. Position the wasp and hornet spray within inches of the hornet nests, wasp nests, and yellow jacket nests, so they don't have a chance to attack. 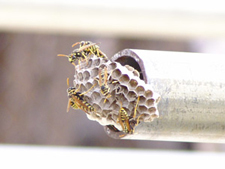 Wasps and hornets are a serious safety issue in schools. Many young children have never been stung before and don't know if they are allergic. Half of all fatalities occur in individuals that are stung for the first time. In a survey of 142 schools, approximately 82% reported encounters with wasps. Approximately 75% use Ortho or Spectracide Wasp and Hornet sprays. The Gotcha Sprayer adaptor has been thoroughly tested to work with both Ortho and Spectracide wasp and hornet sprays. The Gotcha Sprayer has been designed to conform with school IPM (Integrated Pest Management) programs. Dramatically reduces the amount of spray needed to reach the nests. Concentrates up to 90% of the spray directly onto the nest.